story develops. The above image is a rendering. Thanks to I09.com and Steve Budner researcher. 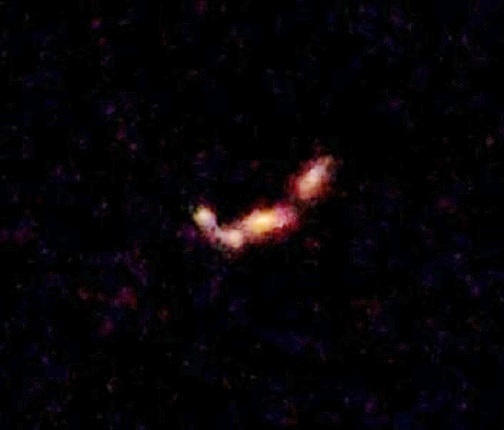 I was standing in my backyard showing my dad where I had actually seen a UFO over the Easter weekend a few months ago. I pointed up to the sky to show him where I’d seen it, and as soon as I pointed up we saw coming from north to south. It looked like a commercial jet flanked by 3 grey/silver looking balls. There were 2 on one side and 1 on the other. They were flying in a very deliberate formation around the jet and keeping pace with it perfectly. As it got closer we saw 3 more grey/silver balls simply appear out of thin air and completed the formation around the jet. 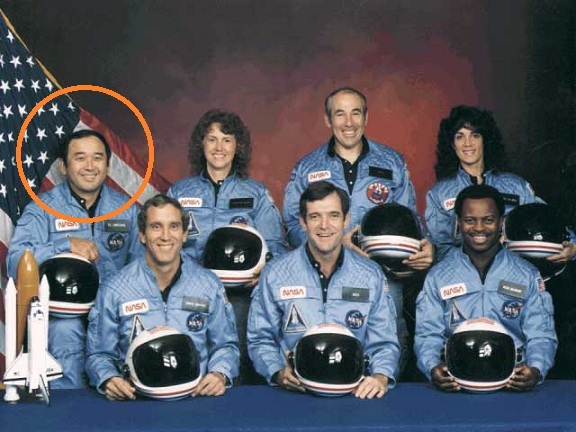 It was a very symmetrical formation with 2 on either side cropped in close to the plane and 1 on each side farther out wide and behind the jet. They were in a very distinct “V” shape. They all just flew over my house and then there were out of sight. 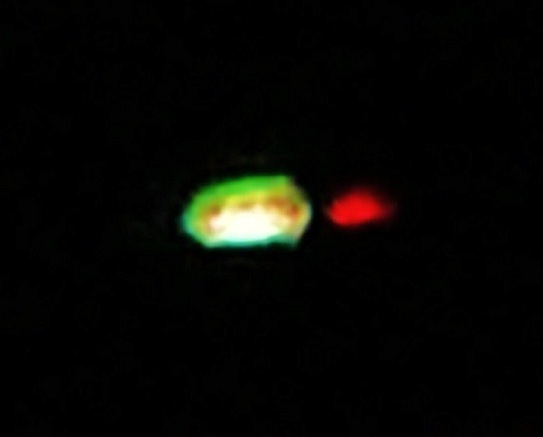 That is the 3rd time in 3 or 4 months that I have witnessed some kind of UFO from just my own backyard. I do live close to an Air Force base. It’s just north of me over the river in Vancouver, Washington.Maybe that has something to do with it? Note: The above image is a rendering. I was at a park in Mt. Shasta, California. My boyfriend and I all went to the park so that we could see the volcano up close and take some good pictures. I was unaware of the UFOs at the time of the park visit and had no sighting of them while I was physically at the park in the town of Mt. Shasta. I first noticed the UFO objects in my pictures a week or so after the actual park trip when I was zooming into them using my computer. I noticed that many (mostly all) of the pictures that I took directly of Mt. Shasta contained little dots that were somewhat hard to notice at first glance when the pictures were not zoomed-in upon. The dots in the pictures are not in consistent spots and seem as if they were moving as I was taking the pictures. I took the pictures over a span of about 5 to 10 minutes and was on my way without knowing that I had even taken photos of the said UFOs. 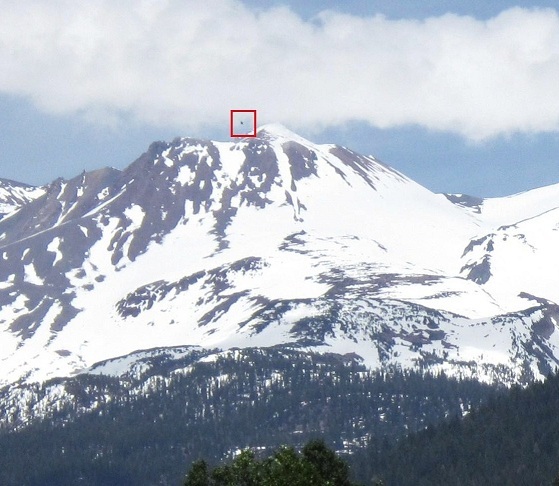 KENS NOTE: Mount Shasta has been a hot spot for UFO’s over the years. Please GOOGLE Mount Shasta UFO and be amazed. My wife and I were on a short vacation in Cape May, New Jersey this past weekend. We were staying at a Bed and Breakfast [ B & B ] with a view of the sea. I was asleep when I was awakened by something. I opened my eyes and saw two beings standing at the foot of the bed. It was dark, but there was adequate light coming in from the street for me to see them very clearly. I estimate that they were between 4.5-5 feet tall because I could only see them from the waist up. They were identical in every way. They were wearing black or dark green, form-fitting outfits that resembled scuba diving dry suits. These included snug hoods that extended from the back of their necks over top of their skulls. On their upper chests was a rectangular, gold or bronze colored plate about 6×4 inches with two rows of inscribed symbols or buttons on them. It resembled an instrument touchpad of some sort. They were no more than six feet from my face and they were both staring right at me. It was a cool, appraising look. It’s the look a cat might give you. Their crania were very large, perhaps twice as large as a man’s. But it was their faces that really got me. They had huge, wraparound, black eyes set above high cheekbones. Their skin appeared coppery or orange in color. I couldn’t detect a well defined mouth or nose, but along the rim of their jaws and down to their chins were some kind of organ-like structures. Gills? Mandibles? Not sure. I couldn’t see their hands, so I can’t say how many digits they had. As I say, I had a very clear view of them. When I realized that this was not a dream I propped myself up on my elbows to get a better view. Strange, but I felt no fear. I was about to say something, when I got this very clear thought, “Something is wrong. He sees us.” I suddenly became extremely sleepy. I tried to fight the urge to lie back down, but it was no use. I felt my eyes closing and that was it. The next thing I knew it was morning and I was awakened by the sunlight streaming in through the balcony door. Once she was awake I asked my wife how she had slept and she said it was the best night’s sleep she’d had in a while. No dreams. This isn’t the first time in my life that I’ve had what could be called nocturnal visitations. As a child and teenager they were very frequent. And often terrifying. As an adult they tapered off to the point where I chalked up my youthful experiences to dreams, hormones, flights of fancy, etc. I had even stopped thinking about them. But this is the first time as an adult that I had such a clear and unambiguous sighting of these creatures. If one thing stands out, it’s the sense of almost military precision and discipline that I got from them. It’s hard to explain, but I got the feeling that these were no-nonsense ‘men’ who had a job to do and followed orders to the letter. They were not there to be my friend or to tell me any of the universe’s secrets. They were under orders and would no sooner go against them than would one of our Navy Seals. And one last thing, they were supremely confident and felt not the slightest fear towards me. I am absolutely sure of that. This case is under investigation by Joe Di Eduardo and Ken Pfeifer of MUFON New Jersey. The name of the witness and some identifying names of the exact location have been changed to protect the principal, as requested.Mrs. Pat Norris, 28, lives with her husband, Carl, and three children in a suburb of Mobile, Alabama. On the evening of February 3, 1983, she had visited a friend in Mobile and when the friend’s husband arrived from work, Mrs. Norris left and headed home on Highway 90. She had turned off the Highway and when about 90 minutes’ ride from her home she heard an explosion. At this point, her car began to vibrate and continued to do so, making it difficult for her to steer. She negotiated another turn off the road she was on, brought the car to a halt, opened the car door and leaned out and down and looked to ascertain if the transmission could have been causing the trouble. It had not.Mrs. N. continued driving and the vibrating stopped. She executed another turn onto another road and saw that the woods ahead were brilliantly illuminated. At first she thought that there was a helicopter search in progress because of the lights and was very frightened. She again stopped the car, and at this point sighted a huge object about l/2 mile west of her. She now feels the explosion she had heard earlier was the object coming down over a clay and gravel pit in the vicinity. Below this top deck window was an opaque window. The area around it was all white. This window was in sections and was inset. The glass was tinted. Below the center of the craft a door was closing from right to left. (See drawing). And she looked onto a street that was dark as if made of asphalt or possible concrete. Off to the side of this street was tubular rectangular equipment. All across the craft she saw rivets and portholes. She said she could see the portholes “inside out” as she peered into the craft. 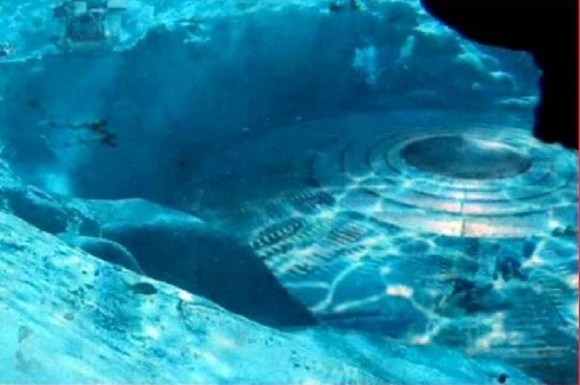 She saw some construction that included “huge I beams like they put ships together with and beams holding the glass in there.” The bottom side was tiered upwards. The construction reminds her of a ship or submarine. She said it seemed possible, very likely, it could have been constructed here on Earth. 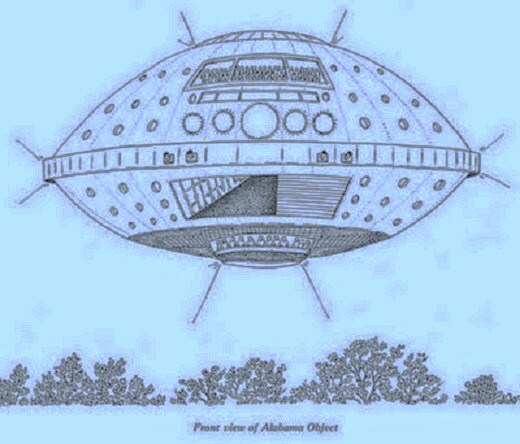 The very bottom of the craft was formed into a cross made with one foot square mirrors and an observation deck hung down and around the bottom with beings in it. In this case, unlike the top deck, the people were peering out, while overhead she heard a very low pitched but clearly audible (almost like a growl) “announcing” coming from the area of the observation deck now closest to her. Mrs. Norris said she believes they didn’t realize she was there until directly over her position. The craft took a southerly turn as it went on from where she was parked. She said it was staying in the wooded area and did not cross Highway 90 again. Possible it was doubling back towards Irvington and Pascagoula. 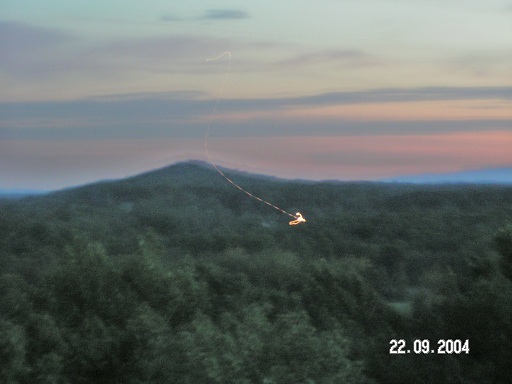 It lit up the wooded area, and all beneath it as it moved on off. It had white spotlights and to the side blue and red lights that intermingled, pointing up to the clouds and then down to Earth. She told Mr. Brown she had prayed she might have such a sighting. She had extensive dream material both prior to and after the February 4 incident. The late dreams contain a detailed physical examination and scan of her emotions, which we expect to present later, when prepared. 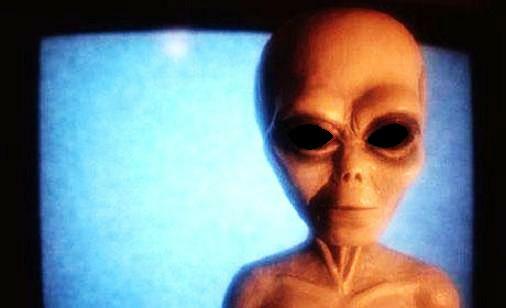 NOTE: the U.S. Gulf Coast from Panama City, Florida to New Orleans, LA has been a hotbed of odd UFO activity since 1960’s and continues to experience a myriad of anomalous incidents. Though this particular case has not received the notoriety the Gulf Breeze and Pascagoula scenarios have it is still one of the more credible and descriptive sightings. Unfortunately, there have been no follow up investigator reports associated with this case. Thanks to Phantoms and Monsters. We are vacationing in Florida and we’ve seen the same object in the sky three nights in a row. My wife was the first to notice it and remarked to me that it looks like one of those UFO photos I’d been looking at. As it appeared to our eyesight, it was extremely high up, at least 10-15,000 feet. 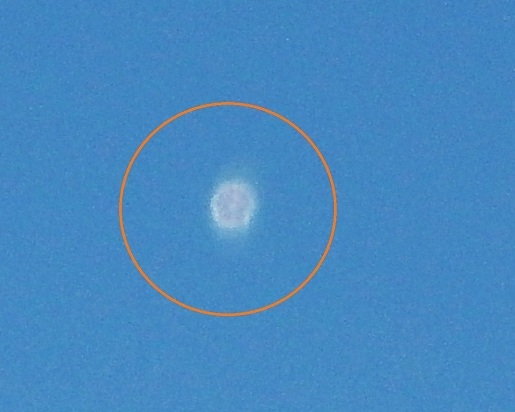 It was, from our vantage point in New Smyrna Beach, south-southwest and possibly near or over Kennedy Space Center. Our impression was simply an object which was changing colors rapidly, same as our 2 daughters whose description was much more defined: an object which has something solid behind it which was obscured by a large light which changed from green to bright white to a reddish color. It was the camera however that got the best look. Keep in mind we’re amateur at best and the object was incredibly high up. However the Camera managed to catch 2 great shots, one from each night. it remained completely stationary the entire time before dissapprearing behind clouds the entirely gone. In particular the second photo from July 13th is amazing when zoomed in! Anyhow this experience has made 4 believers more for the world. We were traveling north on I39 as we approached the Tonica exit, we noticed several objects, black against the evening sky, to the western horizon, presumed them to be helicopters, as we’ve seen a helicopter convoy through that area once before. A few miles further on I had been watching this current convoy as far as we could before the terrain blocked them out. As we got off at the first LaSalle exit, heading north, I looked to the skies towards where the convoy would have been, and then an odd lighted object; higher, slightly closer, could be seen. I had my camera, and took a picture (picture 1) before losing sight of it as we descended into the valley. Did not see it anytime beyond that point in the daylight. A couple of hours later we are heading home, south on I39, and as we approached the Tonica exit, I looked to the west and the activity was still in progress, I took a photo of the object, even closer at this point, still a couple miles out. The “helicopters” if that is what they were, were much closer, half mile or less, and seemed to be lifting off from the fields. Surrounding the object in the sky, it had a large whitish rhomboid light, (looks rather greenish on film), with depth to it, like a large chamber, and a red light to either side and slightly behind, the whitish light. 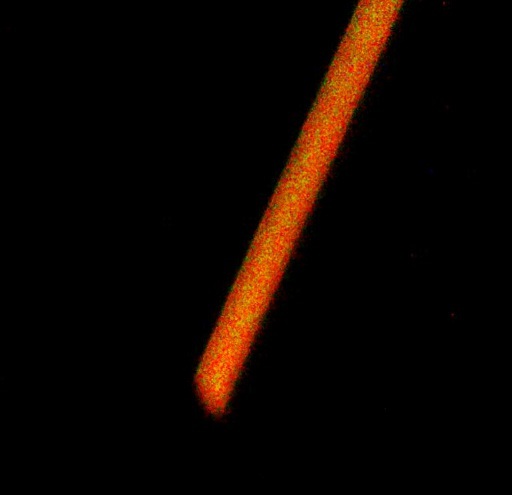 It was slowly weaving back and forth, so sometimes both red lights were visible, other times only the one. I took a few pictures, would check the picture and delete it if it was too blurry. I only had a few spots left on the SD card. I got one good night time close up (picture 2), and then its lights went out. I had my wife stop the car, and I got out on the interstate to take a couple of pictures of the lifting off “helicopters.” I took two more pictures, a still photo (not sent), and a 30 second time lapse of the area (picture 3). I set the camera on the hood of the car, it was still running, so the picture is a bit jumpy, but not as jumpy as it would seem please note by looking at the centered ascending lights, then note how much smoother the plane trajectory is in the upper left of the time-lapse, this compared to the wild movements of the closer two lights. Once they got to their altitude they moved off in near opposite directions. 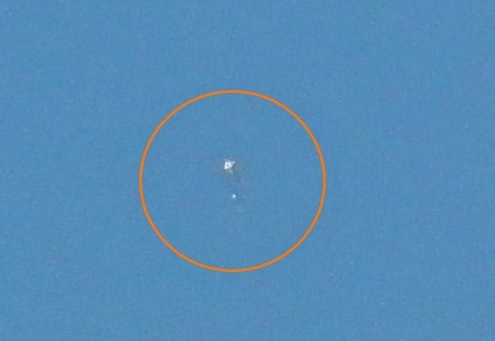 The other “helicopters” are further away to the far right of the picture and did not get on film, they were further away and behind the main object. Note: I never really heard the helicopters, it was still busy on the interstate, only 7 PM or a slight bit later, but they were close enough I should have heard something, but I didn’t. They moved off for a while, the light intensified remained constant, then as one, they shut off their lights as well. No strobes on any of the “helicopters” anywhere, anytime. Thanks to MUFON and their case management system. As a tourist to São Paulo, I was returning from photographing a park called Parque da Independéncia on saturday July 9th, 2011 (4pm local time), coming towards Ipiranga CPTM train station to take a ride back to Bràs station, when I saw a shape floating over the neighborhood of “Vila Prudente”. The shape caught my eye, because when it was moving, it looked like the sun was making different reflections of light from the object like a mirror in the sky, plus keeping my eyes focused on the object, it seemed to have blueish, blinking lights. I took a couple of photographs of the object with my Canon X-43 digital camera, 10x zoom on max, from the entrance to the Ipiranga station, looking at the object, which was slowly moving about against the clear blue sky. When I entered the station and went to the open air train departure area, I was unable to locate the object again. All in all, I saw the object for about 15 minutes. Gettysberg Battlefield Tower on top of culps hill which is a conical cone shaped hill with a 125 ft observation tower on it. I was taking a picture down the Union line toward the Round Tops. It was about 6:30 pm looking towards Little Round Top with Big Round Top behind looks like a shaky camera but its two hills about 2 or 3 miles away. Shutter speed was 1/120 second.I used a digital minolta camera. 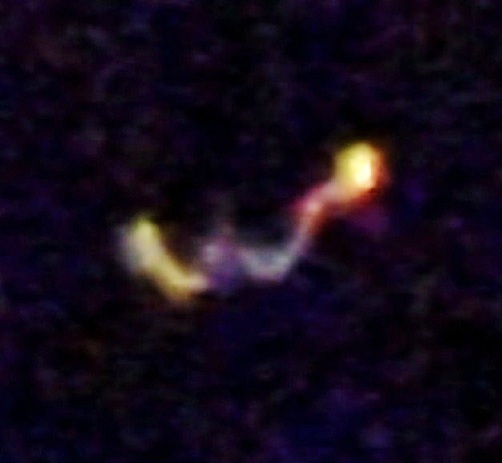 Object left pulsing trail in that short time and traveled quite a distance. I want it to be seen by whoever is interested. I give you my premission to post on your site. 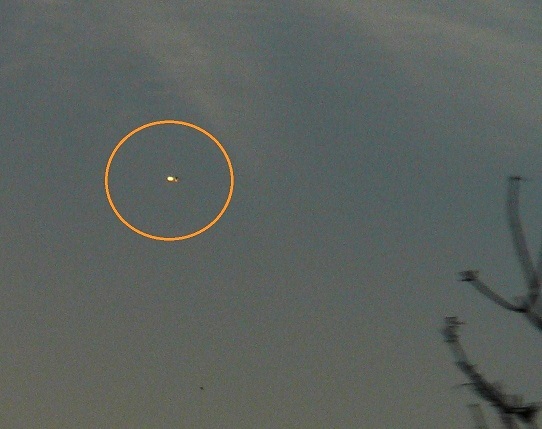 This sighting was reported to World UFO Photos. Special thanks to Paul from Missouri. He was the photographer. I was on the on the phone parking the car when all of the sudden directly in front of me, traveling horizontally from South to North along the treeline, I saw a bright orange ball about the size of a tangerine held at arms length. My first thought was, “oh look at the gorgeous firework”. Then I realized that it was moving far to slow and steady to be a firework and way to level to be a Chinese lantern. I exited the vehicle quickly realizing that this was not something I had seen before, and was both alarmed an in awe. I am surrounded by farmland and it’s a clear night on the Fourth of July….I am used to seeing all kinds of stuff this time of year…but this was different. This could only be described as nothing other than a bright orange fireball. It made NO noise whatsoever. I hung up the phone and quickly tried to take a picture with my camera phone. But try as I might the photos weren’t clear at all, and I was now running to keep up with it as it continued along the horizon gradually getting only slightly smaller. I then proceeded to try and get a video of the object from my phone…however the camera only saw black sky on the viewfinder. Now I was confused, alarmed and increasingly agitated . In the video all that can be heard are crickets and me saying “what is that?! and why is not visible on the camera? ” (That’s right I am the stereotypical guy that could not get video of the blasted thing in a day when EVERYONE has a camera on them. I won’t waste your time by posting the video its 20 seconds of me yelling at myself ) I put the camera away as I came up on the end of the dead end street I live on and met the edge of a large farmers field. It was at this point that the object had slightly curved ahead of me, and was now directly due north. It was then without warning or sound that it moved straight up in the sky at a high rate of speed until within milli-seconds it went from the size of now a ping pong ball held at arms length, to a the size of a large star, only to shrink to match the size of any other star within the night sky. It dissipated into the sky like a star just fading out. I kept repeating to my self now, “no one will believe me, I couldn’t get it on film… I maybe have on VERY blurry picture of it. I cant tell anyone… who will believe me?? I stared waiting to see if I would see anything else for only a minute or two…perhaps firework or a plane or anything, and it was just silent. Nothing. I turned to walk back to my home and proceeded to call my parents who I was on the phone with when this whole thing started, to explain to them why I had hung up so abruptly. As I began to explain, from the corner of the sky where the object originated, came three helicopters, flying in formation moving in from south to north following the direction the object went. I watched them until they disappeared from site…they took much longer, and they made noise. 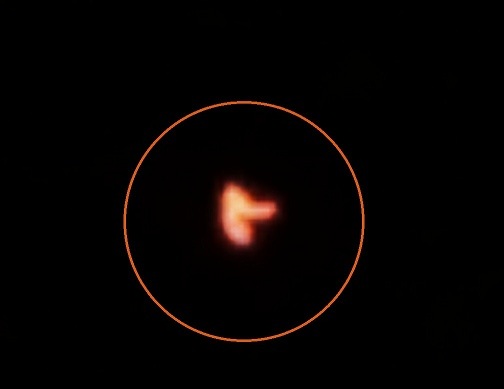 I have NO explanation for what I saw… it was huge, it was glowing bright orange and looked almost like it was on fire….it moved slowly and completely parallel to the ground until it shot off into the sky. It just defies explanation. I am attaching the one phone photo that actually came out. Its a really lousy picture, with no frames of reference and would never hold up in court… but its all I have. I just don’t know what to think. KENS NOTE: UFO’s seem to be interested in fireworks and airports. The lights may attract them from earth orbit. Three of us were on a sailboat in the Albemarle Sound (North Carolina) in route from Manteo (departed near 9:45 a.m.) to Coinjock (NNW). We were motoring at 7.5 nautical miles per hour & had passed Kitty Hawk to the East at 10:50 a.m. on July 1, 2011. I believe that we were southeast of the mouth of the Pasquotank River. We were constantly scanning the water watching for crab pots, debris, sailing markers, etc and hoping to see dolphins. Around Noon I saw in the distance (NNW, 3-5 miles) a very large white shape, rectangular with rounded ends. It was so pale it blended with the skies & water but was distinct from the nearby trees. There was some smoke from the peat fires to the East so the view was not the best. I studied the sight with binoculars & didn’t have a clue about what I was seeing. I pointed it out to the other sailors who also looked and had a similar reaction. We could not determine if the object was hovering, floating, teetered or otherwise secured. It did not seem to move. I took two pictures though it was very hard to see the object in the lens. I zoomed out (shutter speed 1/1250; focal length 60.0 mm) in the direction I was looking & clicked twice. Remember, we were on a boat so holding a camera steady is a challenge! 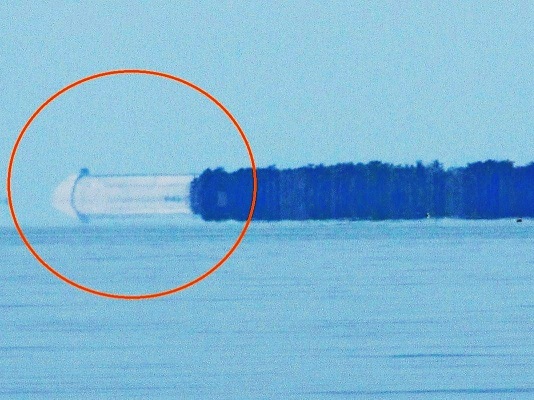 The first picture shows the complete object that we estimated was over 200 feet tall and 1000 feet long. The second picture shows the object partially hidden by trees. 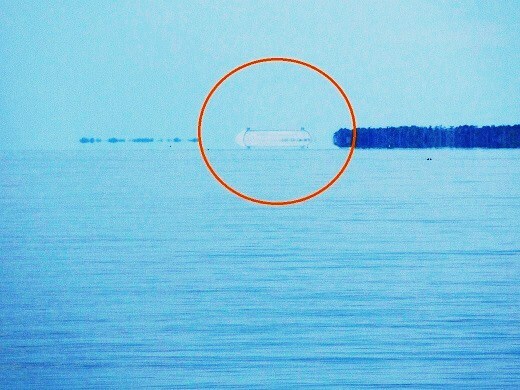 (The object was NOT moving; our boat was taking us out of sight of it as we continued our trip.) Look closely in the trees to the right & see a house to get perspective of the size. We wondered if it was a blimp since we had seen a blimp and blimp hangar on June 21 when we were leaving Elizabeth City. But, it was much larger and a different shape from any blimp we could recall. 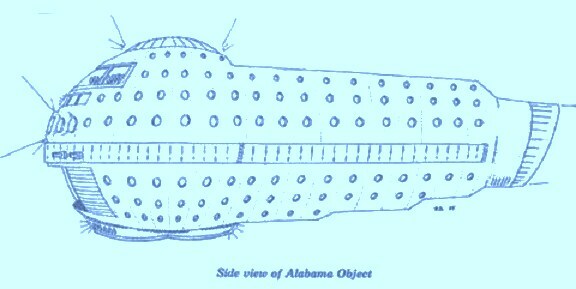 The bulges on either end of the object and the lack of “fins” plus the sheer size of it made us doubt that possibility. Also, there were dark squares that appeared to be windows near the mid-line along the right side of the object. At the time we were wondering what it was, trying to figure it out, knowing we had never seen anything like it. We were curious but assumed there was a logical explanation. We chose not to investigate further as we were meeting friends and wanted to get to port before any afternoon showers might appear. When I first saw the object I thought it might be a firework, but it was so big and moved straight across the sky from East to West. I thought maybe an airplane was on fire, but it didnt look like an airplane. It was very triangular shaped with a point at the top almost like a fire with the light flickering darker and brighter. It held a straight steady course across the sky until it raised up and completely disappeared. I am a skeptic, but can’t believe what I saw!! My husband and son saw it too. I took a picture of it, but it basically looks like a red streak of smoke. You can somewhat make out the triangular shape on the left side of the streak. I turned my camera when I took this picture, so it should be viewed with the streak going horizontally. Me and my spouse was traveling southeast on I-49 between Natchitoches and Alexandria,La. It was about 58 degrees outside. While in our car, my spouse says what kinda airplane is that? Well I have been in aviation and aerospace for 37 years. When I looked up to the left side of the winshield we saw an up-right triangle floating . I kicked on my aviation knowledge and tried to make it an aircraft. 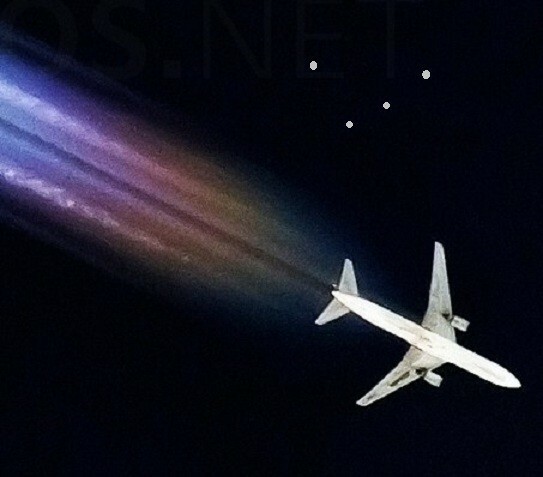 There was no wings, no contrails/ice crystals, rotor blades, empenage or propellers . I told my spouse it’s not a aircraft. It was approx. 500 to 600 feet up. Then two more just appeared then three more appeared. There was a total of 6, upright flying triangles. I still remember the formation when they appeared. The sky was blue and a few white puffey clouds. They were light gray but when they turned slightly to the right one of the craft reflected the suns golden rays into my eyes, it was like a mirror finish on the surface. Then after about 5 minutes, I thought about my video camera in the trunk of thr car. I thought if I stop the car to get the video camera the craft would be gone. Then I thought if I stopped to get the video camera a car or truck could be coming down the hill then. I thought of my saftey so I kept driving and we kept observing. Then three craft disappeared, then two disappeared then the first one disappeared. I looked to see them fly off but they disappeared. I have been obsessed with this for the last 6 months. I don’t know why we waited 10 years to talk about this. This was 100 % real and it is true we are not alone. Me and my spouse are witnesses and she just wants me to stop talking about it. There was no sound or lights, just smooth slow manuvering. I am interested in these craft and I hold a F.A.A. Airframe & Powerplant certificate and a Quality Assurance Certificate for the Department of Defence. 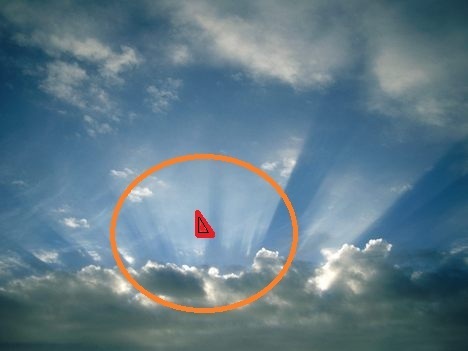 This sighting was reported to World UFO Photos. The above image is a rendering. Special thanks to A.G.F. AND P.S.F. They are witnesses to this event.